When "troubled teens" are embroiled in gangs (ONCE UPON A TIME IN America) or drugs (TRAINSPOTTING, REQUIEM FOR A DREAM), it is a life decision, a commitment to those lifestyles that drives their drama. 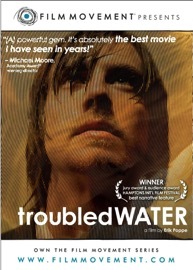 In the Norwegian film, TROUBLED WATER, a teen commits one thoughtless act that has life-shaking consequences long after he tries to atone for it. He was not driven to it by desire for money, addiction, or broken family, just one lapse in judgment. Pål Sverre Valheim Hagen won a Norwegian film award for this breakout role as Jan Thomas, who, as a teen, kidnaps a 5-year-old boy. We catch up with Jan in his early 20s, as he completes his sentence in a juvenile jail. We learn he is a principled, sensible guy and a talented organist. He still has flashbacks of that fateful day (that reveal ever more harrowing details) but he wants to put it behind him as he starts a job as a church organist. Jan seems to find his feet, the church job including an apartment, a bike, welcoming staff (like Terje Strømdahl, who asserts "if he can't get a second chance here, then where?") - and a female priest hot enough to be in ABBA (Ellen Dorrie Petersen as Anna, in her second film role). And Jan gets to rock out with his stops out.Until the mother of the kidnapped boy recognizes him. From review: "Troubled Water observes the inevitable merging fates of two destroyed lives with compassion and without judgment, while posing the question: Do we ever stop paying for our sins?" What is the allure of revenge? What makes it so hard to stem? What makes these movie characters particularly real and sympathetic? How does the literal river with rapids become a source of trouble and redemption in the story? Why do you think Jan takes the kid in the first place? Our 'bad' or 'good' choices have ripple effects. Give examples from the movie. The pastor Anna initially has a belief that forgiveness is unimportant, we just need to accept what is. Would she have revised her belief by the movie's end? To what? How does the technique of seeing the same scenes from different perspectives change our viewing experience? What is important about confession that allows people to take responsibility, and to provide closure for yourself and others? What biblical stories does 'Troubled Water' remind you of?